I had this post up for a short time then took it down to, ahem... clean up some inadvertent language problems that crept into the sound track. It's all mo' betta now. It took longer than I thought it would because I'm new to YouTube and how to edit videos on their site. That was an exercise in frustration. All done now and I've learned how to do some things with video, so maybe I'll post a few more as time permits. One of the things that YouTube tries to do, is to help you present your video in its best light, so to speak. They asked several times, "We detected your video may be shaky. Would you like us to stabilize it?" Of course I refused. That was kind of the point of these videos. I wanted them to be shaky, no 'may be' about it. Everyone likes a good carnival ride now and then. Here's one you're sure to. You can take it coming or going. You might think I'm talking to myself in the videos, but, as usual, I have a couple of the girls, Secret and Cindy, with me. They love going for rides, even if it does jar their teeth. I figured that after all my bellyaching about the road, that I should show you some of what it's actually like. 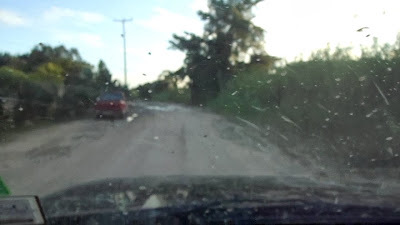 So, I took my camera in hand and drove up and down the stretch of our road (Ferry Road) that we travel on all the time to give you some idea of what the road may actually be like. Truthfully, it was my night to cook, so I killed two birds with one stone. Grabbed the camera and did this bit, but, I also went into town to Chon Kong Restaurant, and got us some good fried chicken for supper. 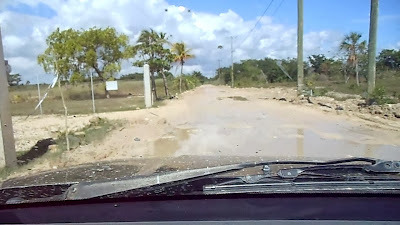 I have it on good authority that further south of us (Going to Town = North, Coming Back = South) that the road gets unimaginably worse, so keep that in mind as you watch one of the videos. Of course, if you've a desire, feel free to watch it in both directions - not at the same time, of course. Pretty much the same thing can be said for a lot of the streets and roads all around town. It has become quite a bit harder to get around town. All the old short-cuts have been cut short, as in the road is probably blocked. Everything should be back to normal by, oh say, next rainy season or so. I had to laugh a bit as you pulled over at the approach to the worst section of road going to town. A pickup approaches the mud bath from the opposite end and decides back up, get out of the truck and wait to see if you can make it. A video voice declares they are dumb M*****F***ers! I'm with the actions of the wise ones in the pickup. The road conditions can be amazingly bad, reliable transportation to town might suggest the need for a boat at times. Oops! Perhaps I need to edit the voice track a smidge. What happened with them stopping was they killed the momentum for us both, making it problematical if either of us was going to get through the mud pit. I'll clean it up and republish it. Thanks for your comment. Videos are now all squared away. Darn, up til now I had been proud of your military background popping up in a small moment of stress! Still happens to me every now and then. You would not believe what happens to the english language when 100 guys are put in a sewer pipe and the hatch is closed for 90 days! I am glad I got to hear the first version!! Yeah, but the music's better in this version! Great videos Save. Though they capture the bone jaring well they fail to grab that feeling when you start sliding sideways into a mud trench that is completely invisible under a foot of water. Great fun. See ya in ........drier times. Or maybe tomorrow. I've been sliding every time I turn into our drive. I don't know how many times I've come close to the gate and/or post. It's just like driving on ice, isn't it? Unfortunately, it didn't translate into video enough to try it again. Friday's looking like a go!